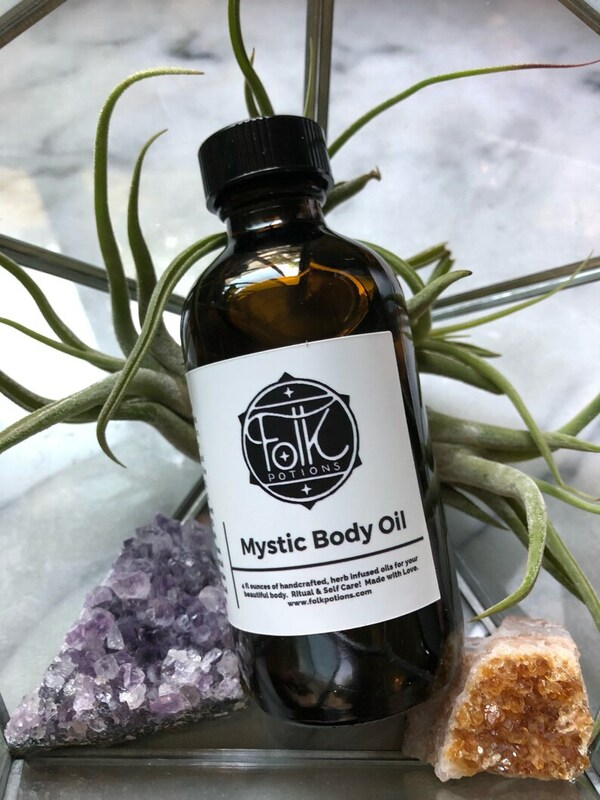 An herbal infused body + face oil for ritual and self care. I infused the most luxurious and skin healing herbs i could find for one whole season. All organic Helichrysum, calendula, plantain, chamomile, rose hips, blue vervain and lemon balm imparted their solar wisdom into a light blend organic virgin olive oil, Golden jojoba oil, meadow foam seed oil, castor oil, sweet almond oil and apricot seed oil. I filtered these herbs on the spring equinox and added the essential oils of clary sage + Roman chamomile. This 4 ounce bottle of oil is perfect for face and body. It is a light but powerful blend that sinks into your skin immediately. Use for moisture or in ritual use. Cleanse your crystals with it. Anoint yourself and send out a manifestation. Make a love spell. Scry for a missing piece of your soul. Be well. Xo, rr. It feel like the most intimate of rituals when I apply this over my body.